Nappy Liners are recommended when you use cloth diapers. They are placed on the inside top of the baby's diaper and come with into contact with the skin. They allow wettings to pass through to the diaper while preventing solids to soak into the diaper. This takes some trouble out of washing your cloth diapers. Just flush away the mess, and spend more time with your baby instead of cleaning diapers. 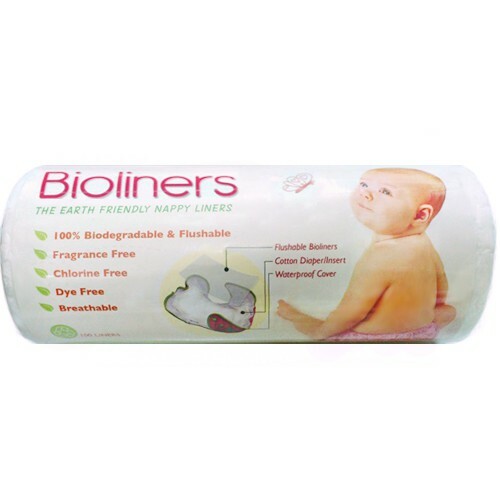 Now with Bumwear Bioliners, using cloth diapers is mess free and easier than ever. Simply tear off a sheet, lay on top of the diaper, fasten the diaper and you're good to go :-) Once the liner has been soiled, simply flush it down the toilet. Bumwear Bioliners are soft and gentle on the skin while remaining environmentally friendly. Bumwear Bioliners are flushable and biodegradable. After many reviews and testings of various materials, we chose to make the liners from 100% Viscose Rayon, a best class fiber material derived from wood, and totally *friendly to the environment. Viscose Rayon is a semi-synthetic fiber and its composition makes it ideal as a flushable, and a high biodegradable(in the sewer) diaper liner. Unlike its close cousin, bamboo liners which have super-dense fibers and are therefore more absorbent, the Bumwear Bioliners retain little in wettings, keeping the wearer dryer and functioning as it should to trap solids and letting liquids through only. They are a wonderful mid-point and in between the common and cheaper non-flushable syntactic ones that we commonly see here, e.g. Pureen®, Tollyjoy® nappy liners, and Pigeon® diaper liners, versus the more expensive natural biodegradable and absorbent bamboo liners. The denser and natural fibers in bamboo tend to retain the urinal fluids on it, defeating its purpose of using it over a stay-dry cloth diaper. As these diaper liners are placed over the inside top of the diaper, the child who just wee-wee'd is skin-exposed longer to the wetness retained by natural liners. Bamboo-made fabrics are good absorbents and it is common to find bamboo cloth as inserts for cloth diapers. Remember the more synthetic the material, the more stay-dry it remains, the more natural the material, the more wetness it retains. In choosing the best liners for you. Do request for a sample piece of various liners and do a simple water pass-through test on them. The goal would be to choose one made for its intended purpose of letting fluids pass through quickly, and retaining as little as possible while trapping solids. Imagine the added convenience of flushing without fear – these are found the Bumwear Bioliners. Generously sized at 20 cm x 28 cm, they can be used for any cloth diapers you have. Please note that the flushing of any biodegradable diaper liner may cause blockage in old or damaged drains and in sensitive septic systems. * It is found that rayon biodegrades twice faster than cotton in the soil. 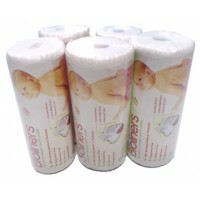 Nappy Liners are recommended when you use cloth diapers. They are placed on the inside top of the ba..